Natural Gas Plants are looking for ways to protect lives and property by installing fire safety valves on, or near automated ball valves, automated butterfly valves and other quarter turn valve assemblies. At the recommendations of the plant safety manager and a risk analysis company, Assured Automation was sourced to come up with a solution to allow automated valves to “fail safe” in the event of a local fire. The FireChek® and FireChek® Plus fire safety valves were recommended. These FM approved thermal shutoffs with resettable memory shape alloy are used to automatically shut down a pneumatic control system when a nearby fire occurs, or when the ambient temperature reaches 135, 150, or 165°F.The testability and reset ability of the FireChek makes it a preferred choice over emergency isolation valves that rely on fusible links or plastic burn-through tubing. The FireChek® and FireChek® Plus fire safety valves were installed in multiple locations on hundreds of automated valves. The FireChek acts as a 3-way stainless steel vent valve. 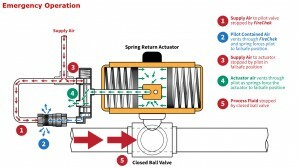 When the triggering temperature of the FireChek is reached due to a fire, the FireChek immediately shuts and blocks the air supply while at the same time venting the actuated valve allowing the actuator to move to its fail safe position. The use of a FireChek Plus allows for even greater venting capabilities by way of an enlarged quick exhaust spool valve used together with the FireChek. The FireChek Plus is ideal for large pneumatic actuators which require a high Cv to vent quickly. Plant fire crews and safety personnel prefer the FireChek to other pneumatic fusible devices, since it blocks the main air supply when triggered; starving the fire of oxygen. Other pneumatic fusible devices open the main plant air supply to atmosphere fueling the fire. Both the FireChek and the FireChek Plus can be field tested by plant safety personnel or insurance inspectors. The FireChek can be manually reset after it cools, something that cannot be done with devices such as fusible links. This entry was posted in Latest News and tagged Fire safety valve, FireChek. Bookmark the permalink.